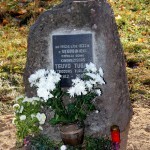 Short description: A memorial sign is placed next to the house where Teuvo Tulio (Teodors Tugajs) famous film producer spent his childhood. 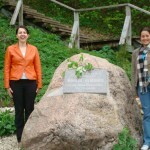 Memorial to Bishop J.Rancāns and LV member of Parliament A. Rancāns. remarkable people who were born in the village of Livzinīki - bishop Jezups Rancāns (1886 —1969) and Member of Parliament, Welfare Minister Antons Rancāns (1897 --1942). 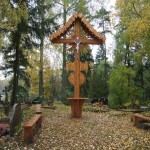 Short description:The memorial is devoted to some famous people who were born in Nautrēni parish Dekteru village: among them the writer Donots Myurinīks (Dekters), the woodcarverand crucifix master Juoņs Cibuļskis (Kopču Juoņs), the linguist Juoņs Cibuļskis. Short description: 3,5 km from the parish centre - Rogovka, in Desetnīki, one can see old Catholic graves where some famous people from Nautrēni parish are buried. Among them are: fighter for people's rights Pīters Miglinīks (1850-1883), a bard Andrivs Jurdžs (1845-1925), some poets Pēteris Jurciņš (1932-2004) and Antons Kūkojs (1940-2007) The author of the monuments is a sculptor Bērtulis Buls. 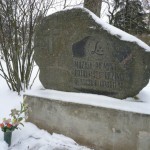 Short description: The commemorative plague is dedicated to President of Latvia Kārlis Ulmanis’ visit to Latgale in 1938. 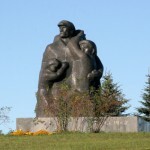 Short description: The monument was errected in 1972 to the victims of Audriņi tragedy which happened in 1942 during the Second World War. 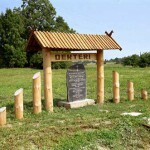 A lot of villagers (291 men) were killed in Ančupāni forest. The author of the monument is Alise Veinbaha. Short description: The memorial plague was opened in 1995. It is dedicated to a lot of people who were sent to Siberia in years 1941 and 1949. 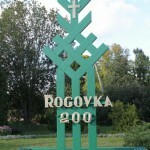 Short description: The monument was opened in 1936. The author of the monument is an engineer Zilēvičs. There are the following words on the plague - We carry sun, freedom and independence to Latgale. 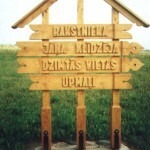 Short description: Upmaļi is the family house of writer Jāņis Klīdzējs who wrote 8 novels, 11storybooks, 2essay books and reflections about Latgalian catholic-Latvian mentality. Jānis Streičs( famous Latvian producer) shot a film in Latgalian, based on the novel by Jāņis Klīdzējs called „The Child of a Man”. The film got critics and audience acknowledgement as well as in Latvia and abroad. J.Klīdzējs died in exile, in the USA.